Environmental Protection Agency Administrator Scott Pruitt has resigned, amid an onslaught of financial and ethics scandals and widespread opposition to his campaign to roll back key environmental protections. President Trump announced Pruitt’s resignation via Twitter. Environmental Protection Agency Administrator Scott Pruitt has resigned, amid an onslaught of financial and ethics scandals and widespread opposition to his campaign to roll back key environmental protections. President Trump announced Pruitt’s resignation via Twitter. Trump later told reporters, “Scott Pruitt did an outstanding job inside of the EPA. We’ve gotten rid of record-breaking regulations, and it’s been really good.” At the time of his resignation, Pruitt was facing more than a dozen federal investigations into ethical misconduct, ranging from lavish spending to asking subordinates to help his wife find a job. 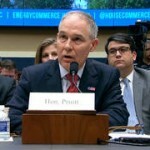 Just earlier this week, CNN reported Pruitt kept a secret calendar and schedule in an attempt to hide his meetings with many industry executives. On Monday, Scott Pruitt fled a restaurant in Washington after he was confronted during lunch by a mother and teacher named Kristin Mink. Mink was holding her 2-year-old son when she went up to his table. Video of the interaction has since gone viral. We speak to Mink about what she did and Pruitt’s resignation just days later. Following Scott Pruitt’s resignation, EPA Deputy Administrator Andrew Wheeler will become the agency’s acting administrator. Wheeler is a former lobbyist for Murray Energy, the nation’s largest underground coal mining company. He’s also the former chief of staff for Oklahoma Republican Senator Jim Inhofe, who is known as the most notorious climate-denying lawmaker in Washington. In one of his most famous stunts, Inhofe brought a snowball onto the Senate floor in 2015 in order to prove that global warming was a hoax. The Trump administration is ending Obama-era policies calling on schools and universities to consider race as a factor in admissions, in the latest blow to affirmative action programs. The move doesn’t change the law, but it rescinds guidelines set by the Obama administration to foster diversity in elementary and secondary schools and on college campuses. The move comes as the Trump administration is reportedly planning a challenge to Harvard University’s admissions practices and as President Trump is nearing a decision on a Supreme Court nominee to replace retiring Justice Anthony Kennedy, who was long considered a swing vote on affirmative action. In 2016, Kennedy wrote the majority opinion when the court upheld the University of Texas at Austin’s race-conscious admissions program.